Everyone loves a party, right? Especially in the bleak winter months of January and February when we all need a lift! Well, when I heard that Angie over at The Novice Gardener was hosting a Friday night blog party called Fiesta Friday, I thought it would be fun to hang out with a bunch of like-minded bloggers and mix and mingle a bit. So, like I normally do when I’m going to a pot-luck, I hit my back issues of Bon Appétit magazine to search for some inspiration for my contribution. When I saw this recipe I knew what I was bringing! It’s perfect for a party and I could make a double batch as afternoon snacks for my husband and I. This is an awesome recipe! Let me tell you, we have been nibbling away at the bowl since yesterday and you guys are lucky that there is still enough left for me to bring to the party!! My husband declared that it should become a staple in our house! That’s a might fine endorsement, don’t you think? The recipe is really versatile. The spice here is savory, but you could make it sweet by using cinnamon, cloves and allspice instead of curry and cayenne pepper. The possibilities are endless really. The recipe comes from the January 2014 issue of Bon Appétit and I have tweaked it and played with the quantities of the ingredients to my taste. So, grab a handful quickly, the bowl won’t last long! Whisk egg whites, agave syrup, salt, cayenne and curry powder together in a medium bowl. 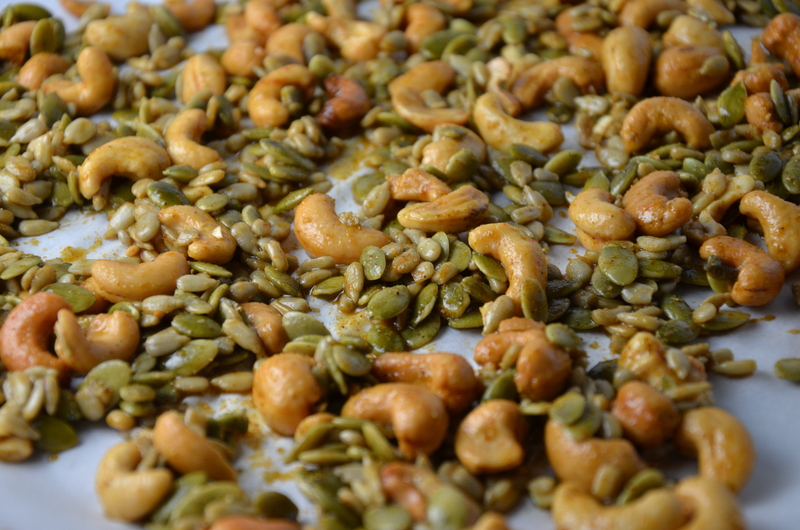 Add nuts and seeds and toss to coat. Use a slotted spoon to transfer the mixture to the lined baking sheet, letting the excess egg white drip back into the bowl. Bake, tossing once until the mixture is golden brown, about 25 to 30 minutes. Can be made 5 days ahead and stored in an airtight container at room temperature. But once your family knows what is in that airtight container, it’s not going to last that long! Enjoy with a frosty glass of beer, or an icy cold glass of Pinot Gris. I guess this party is BYOB, isn’t it? I’ll bring some wine! You’re so welcome! I hope the rest of the guests enjoy it too! Thanks so much for hosting this festive event. Have a wonderful weekend! This looks like a lovely addition to any gathering – I must try this – and soon! So glad you think so! Really nice to meet you too! You have a lovely blog, by the way. I am looking forward to following you! just the recipe i was looking for! going to make it soon. You are so welcome! How lucky you are to be able to dry your own seeds and have enough space to grow pumpkins! I am envious. I sure hope you like the recipe when you make it. Good to meet you! Thanks so much. I love it when I find something really delicious that is quick to make! I hope you get a chance to try it.. Please go ahead and invent that virtual conduit. 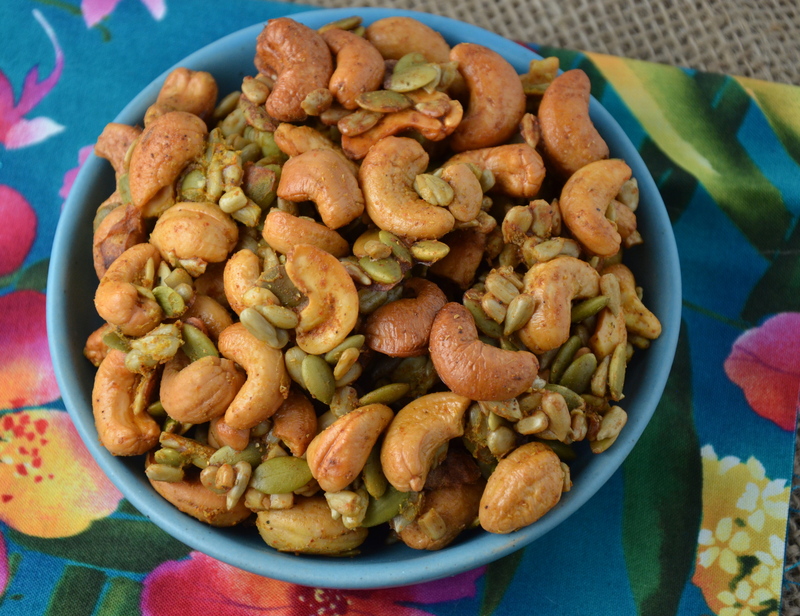 I am drinking a glass of Pinot Noir right now and If I had these wonderful luscious looking spiced pumpkin seed and cashew crunch, my evening would be complete. They look simply delicious! LOL! We have a lovely Shiraz on the go! I will get right on that invention! Mmm…I bet I could polish off that entire bowl in one sitting! LOL! I bet you could too! And, I made a really big batch! Give me spiced nuts anytime! Love your recipe. I know, me too and I now realize how easy they are to make and that I should make them more often! Thanks for taking the time to comment! Cheers! Hey there! Thanks so much…I tried to bring something that everybody would enjoy:-) I really like curry too and have many favourite recipes using it. I know, this is a great party, don’t you think? Great way to find other bloggers. Thanks for taking the time to make a comment and have an awesome weekend ! So glad! Simple and delish! Thanks so much for stopping by! Have an awesome weekend. Yum! That’s a great, healthy snack! Yes, I’m going to try to collect some healthy snack recipes this year 🙂 Any suggestions? Glad you think so! It is so easy to make too, which is a nice bonus! I’ve got cashews and pistachios in my cupboard. Think they would work with the curry flavor? I bet it would be good – it never hurts to try, don’t you think? Let me know how it turns out! This looks amazing! I absolutely love nuts and seeds, and have never thought to use eggs white as a coating before baking, though it makes total sense to help stick the coating. Oh, I wouldn’t be surprised, but I wouldn’t hold it against you! 🙂 I would be right behind you doing the same! Thanks so much for stopping by! Thank you for recently visiting my blog. I love this recipe above and would love to try this, so if you don’t mind will save it and enjoy using it one day. I love healthy snacks. I will look over other posts or recipes you have also. 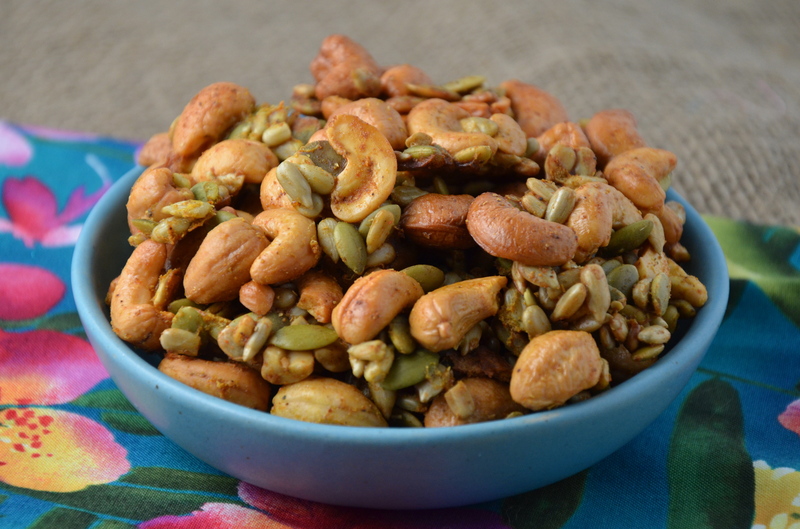 Thanks to Chef Julianna for this spiced nut-mix recipe. I’m planning to make some later this week. Looks like a keeper! 😉 Happy Snacking. Always my pleasure to share wonderful recipes with fellow food lovers! 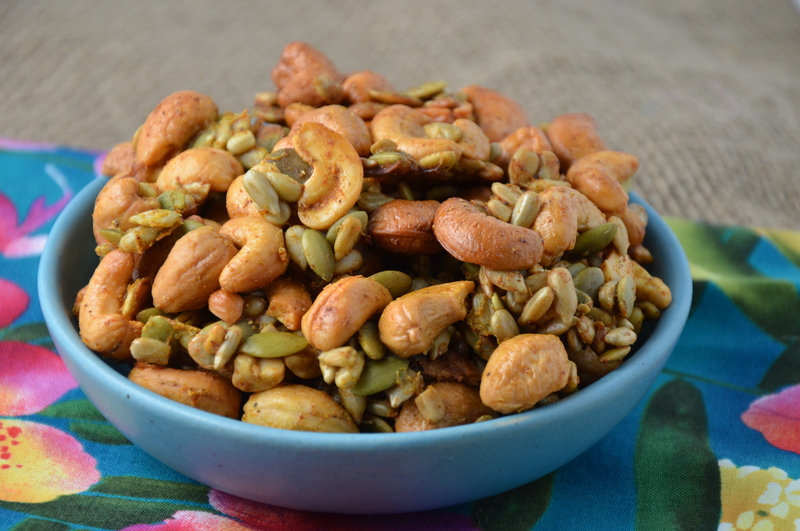 I had to share this delicious nut mix! For a gluten free option, any type of nuts which are covered in sauces or spices are often gluten based (the ones you would buy is the supermarket). This is an awesome and simple alternative! Hi Chloerissa. This is so true. I read “Wheat Belly” and was shocked to find that gluten is used so much in processed foods. That is why more and more I am cooking from scratch. You can really control what goes into your body. Thanks so much for re-blogging my recipe. I really appreciate it!